When we wrote our book in 2006 Audrey and I were certain of one thing: A person’s weight, fat or thin, is not the problem. We have ALWAYS been sure of that fact. We are not suggesting that our weight cannot cause or exacerbate health issues, we know that being significantly fat or very thin can directly cause serious medical problems. Nevertheless, the weight itself is not the primary concern. The weight is almost always a symptom of more complex physical, emotional and psychological problems. And Audrey and I have always been determined to get to the root of the real problem, not to keep focusing endlessly on the symptom; the weight, which is what over a century of dieting and healthy eating has done, only to see the problem grow exponentially. If weight is the problem, and losing weight is the solution, we would surely all, after decades of Weight Watchers and Slimming World and their cousins, be slim and healthy by now. Quite the opposite is true, we are in a worse situation than ever before. And that is because for so long we have been addressing the weight as the problem and ignoring the real issues. If you are carrying excess weight and you lose it, you may see improvements in your physical health. If you are carrying excess weight and you begin to eat in a way that you consider healthier, you move your body in a way that feels good and you do both of these consistently and sustainably, even if you don’t lose weight, you are likely to stop yo-yoing up and down or steadily gaining weight. Your health, both mental and physical is likely improve significantly. Following the principles is not an excuse to stay fat. In a world where people are criticised, judged, discriminated against, often limited in their choices of travel, clothing, sport and entertainment because of the size of their bodies because we refuse to cater for them appropriately, why would anyone choose to use Beyond Chocolate as an excuse to stay fat? And maybe, in the crazy body obsessed world we live in, people who have spent decades, sometimes a lifetime, desperately trying to lose weight, to have the right body, arrive at a point in their lives where they choose to step of that crazy treadmill. We know that after years of deprivation and overeating our bodies can get to a stage where weight loss is virtually impossible. Our bodies are so intelligent, and when we repeatedly diet and overeat, they stop responding to attempts to lose weight by conserving energy and holding tight. Losing weight after years and years of yoyo dieting can be nigh on impossible for many people. But in many ways it doesn’t matter. Because, if we focus on eating nourishing foods that we enjoy and we move our bodies with our overall health and wellbeing in mind, we can be as healthy as anyone else. And we can stop the mental and emotional torture which the diets keep us trapped in. FAT does not equal unhealthy any more than thin equals healthy. Yes fat people can suffer from health issues exacerbated or bought on directly by their weight. And if going on a diet or or focusing on losing weight works for them, not just for 6 months or 2 years but for life, then we wholeheartedly applaud and support them. And we know that for the vast majority of people that’s not how it works. Focusing on weight loss just causes more problems. Not only does it set up a lifetime of disordered eating, thus compounding any health problems, it also has a significant impact on people’s mental health, leaving them feeling bad about themselves, ashamed, embarrassed and frightened. Just because someone is fat does not mean they are unhealthy. It is high time we stopped behaving as if that were the case. We know that there is so much misinformation and confusion about this subject in the media, in the NHS, in the world at large, that many people still genuinely believe that they are not helping fat people unless they suggest that they should lose weight. Here at Beyond Chocolate we categorically refuse to collude with those who blame, criticise, pity or patronise people who are considered fat by purporting to know what they need. 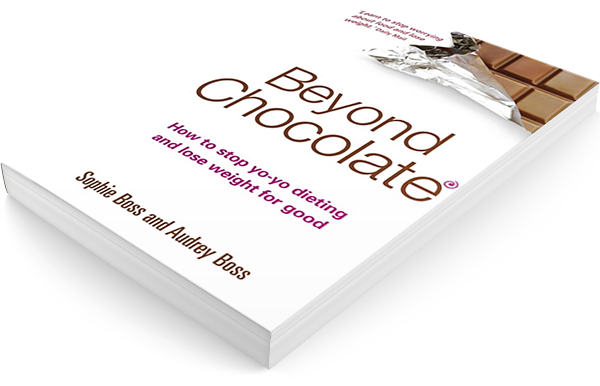 When Audrey and I wrote Beyond Chocolate we were writing a book about our relationship with food and our bodies. We had spent so many years chasing weight loss and we had finally found a way of stepping off the diet treadmill that had truly worked for us. We felt free and good in our bodies for the first time in our lives. We had been running workshops and courses for about six years and when an agent approached us with a book deal, we were delighted and very excited. Our publisher, Judy Piatkus was a one woman band. She had built a highly successful publishing company which has now been bought by one of the largest publishers in the world, HACHETTE. She liked us. She liked our ideas. She liked our book. Except for one detail. She didn’t think anyone would buy a book about how to stop dieting unless we promised weight loss. She knew that our ideas were cutting edge and exciting and despite agreeing with us, she understandably had her eye on the bottom line. She had no intention of publishing a book that would sit on the shelves gathering dust. I remember the days Audrey and I spent coming up with ideas for the strap line. None of them mentioned weight loss. She fought us all the way. The current strap line was hers. After weeks of arguments and negotiations she called our agent and said quite simply, “It’s this strap line or no book”. We were tempted to walk away. It felt like such a betrayal of everything we stood for. She was even demanding that we re-write some of the chapters and add in mentions of weight loss – if you read the book with this in mind you’ll see how the mentions of weight loss are almost tagged on to the end of paragraphs and ideas. We literally added them in at the last minute. We decided that it was worth biting our tongue and accepting the compromise, huge though it felt. We wanted our ideas to be out there. In those days what were were saying was radical and new. No one else in the UK had written anything like it. So that’s why it may sound confusing to you when we say Beyond Chocolate is not about weight loss. If you’ve read our book, I’m not surprised. We are not for or against weight loss, we are just not interested in it. We know that it’s not the point. We know that even if it is some people’s goal, the only way to achieve that goal is to set it aside and focus on the process; our relationship with food, how, what and why we eat and our relationship with our bodies; how we define ourselves, how we move, how we connect with our physical body. We know that it’s about making tiny changes, one step at a time. It’s about making mistakes and learning from them. It’s about curiosity and experimenting. We know that those changes will only be sustainable if they are of value in themselves and we feel the benefits directly, rather than just being a step on the ladder to weight loss. The more we focus on weight loss, the more it eludes us for the long term. Tune in and Be Your Own Guru have always been our most valued principles. We want to empower people not enslave and trap them. We want people to be curious and interested in themselves, their eating and their bodies, not follow a plan obediently because someone else tells them it works. Most importantly we want people to be free of the blame and shame that they live with when they are told that they are fat because they are lazy, greedy, stupid, ignorant or making excuses. I’d love to write here about how poorly we treat people who are too thin as well, but that really is the subject of another post. We know that there are countless women in our community who have lost weight. We also know that there are as many who have not. And whilst they may not have lost weight they have stopped gaining and yo-yoing up and down. And all those women share similar experiences. They eat in ways that are more nourishing and balanced. They don’t overeat the way they used to. They have brought movement into their lives in a sustainable and pleasurable way. And most vitally, they feel good about themselves. They have reclaimed their self worth, their right to hold their head up high, they know that they deserve the same respect, kindness and care as anyone else, fat or thin or in between. The Beyond Chocolate community has always been and will continue to be, a place of refuge from the madness of a society obsessed with body size. A society that values slimness above all. A society that has no idea how to find lasting solutions to the fact that we are getting fatter, too scared to admit that decades of putting people on diets has been part of the problem not the solution, a society that would rather blame its victims than hold their hands up and admit that they have no answers. So please know that you are welcome here. You are welcome whatever your body size. You are welcome if your goal is to feel empowered, energised, supported, connected and free.